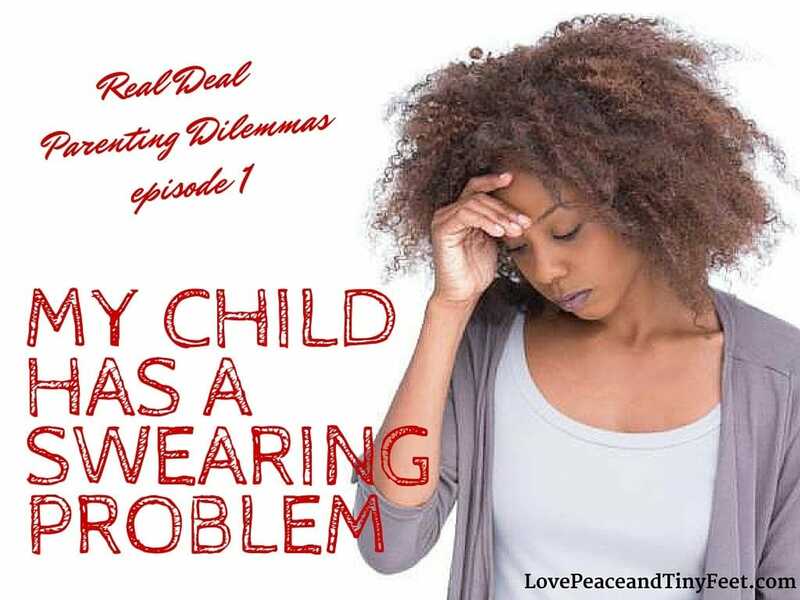 The following is a real deal dilemma shared by a parent whose child is experiencing a bit of a swearing problem. Readers, how would you advise her to handle it? My 2 year old has been swearing a bit. It started with the F word. I would ignore it anytime she said it and that seemed to work. But yesterday she said “F*** you” about 4 times to me. Ignored it but that hasn’t been really working this time. I tried telling her “do not say that. It is not nice. You do not say that” not doing much either. My 2 cents – It was the strangest thing, but my oldest was somehow always great with recognizing the words she was not supposed to repeat. We used to be terrified that she would just end up repeating them at the wrong time or even better, around our church friends or other mixed company, but she never did. My youngest on the other hand, would have a field day with curse words upon first discovery. “Sh*t, Sh*t, Sh*t, Sh*t, Sh*t, Sh*t, Sh*t, Sh*t… she chanted almost for an entire afternoon! first discovered a few curse words (yeah, she probably overheard it from me and my potty mouth). I kept trying to tell her to stop saying that word, but she was having way too much fun getting a rise out of me. It finally dawned on me that she only knew they were bad words because of my reaction after accidentally letting one slip, not because she knew what the word meant. So…I played a little game and started saying non-curse words (words that she doesn’t hear often), then reacting all nervous as if I’d said a bad word. Wouldn’t you know it, she started gleefully repeating those words and I got a kick out of it all! How would you advise another parent to handle a child with a swearing problem? What are some Real Deal Dilemmas you’ve been experiencing? Share those below! My kids have never sworn like that because they never heard it from me. If we were around another child doing it, we would avoid that family like the plague. I agree – it is important to choose friends wisely. That’s awful that a 2yo knows that phrase. We never hid cussing from the kids. I’ll be honest, if I’m not careful I’ll cuss like a sailor. My son has heard everything from d*mn right up to f*ck. Yet he never cusses in public. Sometimes, I’ll hear a swear or two coming from his room when he’s playing Counterstrike, but it’s not an ongoing thing. We raised my son on being real. He’s 14. At 5 he was headshotting me in Red Faction. Why? Because he loved playing, and he knew it wasn’t real. When Deadpool comes out on cable, we’ll watch it together. He’s becoming a young man with a clear sense of right and wrong, real vs. reality, and how to treat people. And I think a lot of that is owed to not raising him with the mentality of protecting him from the world. The world is going to hit him like a tidal wave when he leaves home. I fee like he’s ready for it. edit: real vs. fantasy. But you know what I meant, probably. Kids always seem to pick up on exactly what we don’t want them to say. My son accidentally dropped a curse word from a movie during a dinner with his grandparents once- we were so embarrassed. My husband was doing a home renovation project and got really frustrated and screamed “Bullsh*t”. Don’t you know, the 2 year old picked up on that quicker than any other word and loved to run around pointing at people screaming “Bullsh*t” at them. It did last a few weeks before she outgrew it. I think it’s because we ignored the behavior and didn’t give her a reaction when she said it. I think that was a really clever way of dealing with that situation. I don’t know what I would have done! My kids are pretty good about now swearing yet…here’s hoping they can stay on this track. I think parents should be firm when it comes to swearing. They need to be a good example too. I think ignoring it is a good way to handle it if telling them it’s not a nice thing to say doesn’t work. Setting a good example is very important. My son is 7 and he never curse. I tend to drop the f bomb when I get very heated but try to never do it around him. He never heard us cursing when he was growing up but the few times he heard it (from me lol) I would say sorry and tell him it’s not nice to say that. Once we were in the bus and someone said the F word and he seriously turned around towards them and said “no you don’s say that, it’s not nice”. This to say, if you let them get away with it just a few times and ignore it then you pretty much saying it’s ok…But all kids are not the same. I hope things work out for that mom. Yeah, it’s a tough one. All kids are different. My 7 year old never repeated anything either.